"Belle Calas! Tout Chauds, Madam!" Ms. Mattie, waved her hands dramatically, giving me her best interpretation of how the Calas women would walk the streets of New Orleans with baskets perched on their heads. While I tried my hardest to roll the cold rice into balls, unsuccessfully. "Mo guaranti vous ye bons!" She continued bellowing -loudly at that- telling of the street vendors in brightly colored tignons near old St. Louis Cathedral selling calas and potato cakes. 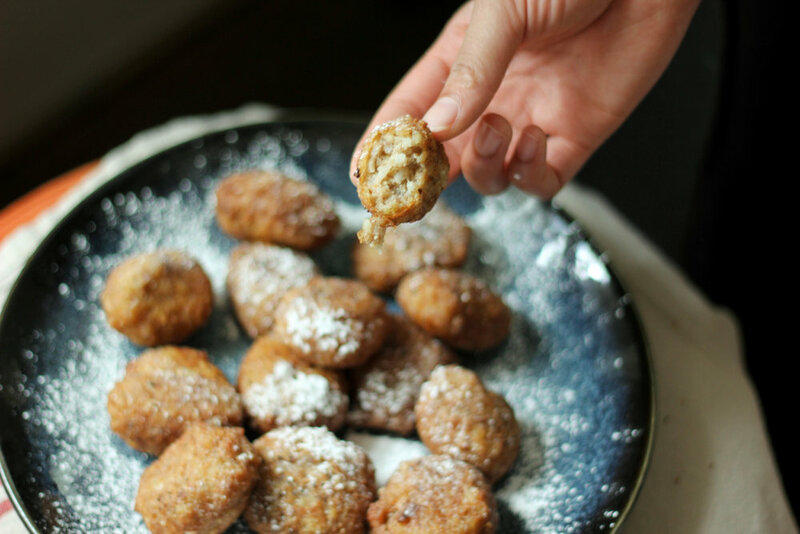 Calas are creole rice fritters, old rice mixed in an egg batter and fried, then showered with powdered sugar. Originally made with rice and yeast concocted the night before of boiled potatoes, cornmeal, flour and baking soda, then left to ferment in the night air. Highly addictive gustatory delights, with a storied past that's as deeply fused in the history of New Orleans as Marie Laveau. A past that helped some enslaved African Americans obtain their freedom. Calas were also consumed in other parts of Louisiana and the American south where mixtures of cow peas and other legumes were sometimes used in place of rice. Like the Saraka rice fritters of Sea Islands in South Carolina and Acaraje sold on the streets of Salvador Bahia in Brazil, Calas origins trace back to Ghana and other parts of West Africa. These rice fritters are very much a part of the culinary African diaspora and were a vital piece in the advancement of many African Americans in New Orleans. Before the Louisiana purchase, while under Spanish rule, the practice of coartación allowed the enslaved of New Orleans to purchase their freedom. Many took to the streets, chanting advertisements for "gaignin calas". Crisp around the edges with luscious centers, these little fritters were, for many enslaved, the key to earning money for these purchases. The ticket to freedom bubbling in hot grease. According to African American Culinary Historian Jessica Harris, "Not all Calas vendors were enslaved. And the ones who were, often sold them for their mistresses. If they were lucky, they were allowed to keep a portion of the money, or perhaps have it go towards their freedom." Even after the Louisiana Purchase, which put an end to coartaion, New Orleans still remained home to many freed slaves who made their living selling calas and other street foods up until the 1940's when only one remained. However, they were preserved in a lot of African American families, eaten on Mardi Gras, on the morning of a child's first communion and on one Thursday afternoon at Ms. Matties dining room table. Over the past decade, Calas have reappeared on more restaurant menus thanks to a few trying to preserve the tradition. The Old Coffee Pot on St. Peters Street serves them with grits.. I love this place, but they do move a little slow. I've had a savory calas in Charleston with hominy and red pepper aioli. Some with red beans and rice favoring a more savory side of life. I've kept this more in line with tradition, honing in on the old ways of mixing in a little cornmeal, with crumbs of stale cornbread. My Mardi Gras fare always includes a hot basket of Calas. As homage to my ancestors, those who came before me, moving oceans, paving paths, making a way for me to be born into a life of freedom.